UNIT 1-1606. OPEN 4/6-13 NOW ONLY $1095 TOTAL! BOOK ONLINE AND SAVE! Let's start with the bedding arrangements: King, Queen Over Queen Bunk, and Queen Sleeper Sofa! That’s room for 8! As much sleeping space as a 3 bedroom! The MASTER BEDROOM has a huge king size bed with a headboard. Really colorful bedding. There’s another big TV here and same cable package located in a giant entertainment center. The SECOND MASTER is equipped with a QUEEN over QUEEN Bunk! With it’s own bath! Put the kids on top and grandma and grandpa on the bottom! They’ll love it. Grand Panama 1606 is a big beautiful place at the beach. And it’s priced right too. The Grand Panama Beach Resort is the newest luxury property on the beautiful beach of Panama City. We look out at the sparkling ocean from our 16th floor balcony and watch beautiful sunsets. 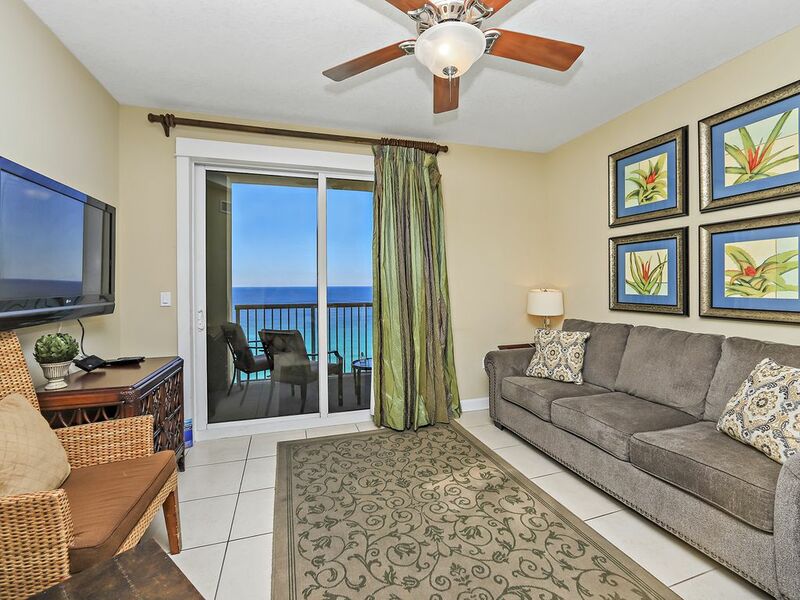 The resort is in the heart of PCB and within walking distance of shopping, entertainment and great dining. The resort has many on-site amenities such as a gym and coffee shop that will keep you happy right at home. This luxurious condo is in the heart of Panama City and close to all the newest attractions and shopping. The newly renovated airport is a plus as well. Two pools and a beautiful private beach will have you coming back just like many of our previous guests. Was in the area for work and was very pleased with the unit. Fantastic week!! Had the best time with the kids!! Very nice property in a great location. The views fro the balcony are stunning! We have a family of four so the two bedrooms were perfect for us. Furnishings were very nice and the staff was super friendly. Will def stay here again! We loved our stay. Very nice entrance and easy access from parking lots to rooms. Pools on beach side and road side for convenience. Room was extremely nice and very spacious. Great kitchen and incredible view! Well worth it!!! This is a very nice unit, things were very clean. However there were a couple of lights that didn't work, one being the under microwave light. It was really nice having that large closet in the master bedroom but the light didn't work in there either. I called Best Beach Getaways to fix it but they didn't get it done while we were there. The unit could use a good painting throughout and the balcony needed a good pressure washing. The curtains also were very heavy and hard to deal with as they kept coming off the rings as you tried to open and close them. Having the nice flat screens was a plus and the cable had premium channels which was nice. The queen bunk beds were very nice and very sturdy. It was nicely decorated. The kitchen was adequately equipped but the living room furniture was in great need of replacing, as the couch had stains, and the ratan chairs were falling apart. This was a nice condo for the money. Great location on the beach. The pool and the hot tub were pretty nice. The grounds were nice and well maintained along with the pool. Really enjoyed the tiki bar. The condo was extremely clean. The location is great. The staff is very helpful and friendly! Perfect Location!! Will visit it again! We had a wonderful time at this condo. It was very beautiful, clean and spacious. I loved being on the 16th floor; it has a great view. I definitely plan on booking this condo again. The owners were very nice and they made us feel like we were family.